A friendly store that carries all things related to bees. 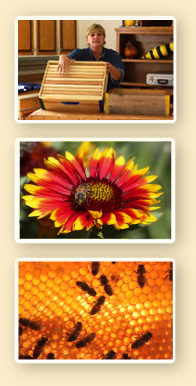 Beekeeping equipment, honey, gifts and more. Please visit our Preferred Vendors for organic and non-GMO bee-friendly plants and garden supplies to help keep our honeybees happy and healthy! We offer over 1,200 varieties of heirloom seeds, garlic, tools, books, and hundreds of local hand-made gifts and food items. Remember—everything we offer is pure, natural, and non-GMO!